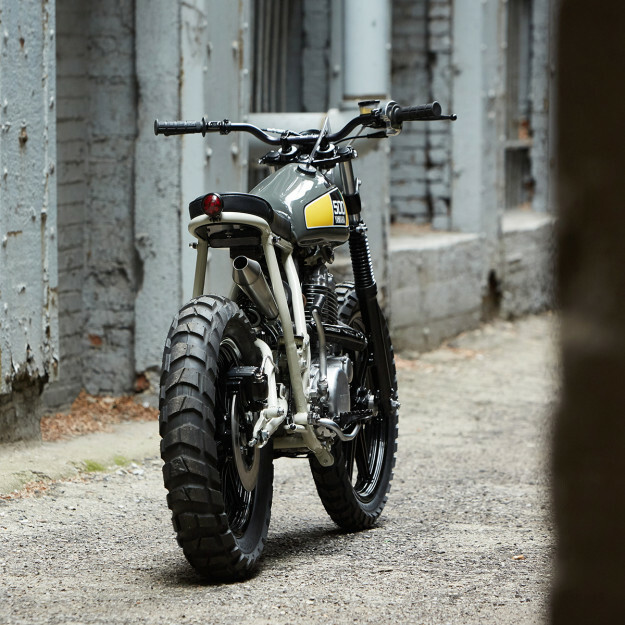 Federal Moto’s Shaun Brandt is one of the rising stars of the custom scene, and he’s wowed us with several of his builds already. But when he wanted a bike for himself, he turned elsewhere—to Mike Muller of Chicago’s Powder Monkees. It’s an odd collaboration, but it’s worked out beautifully. 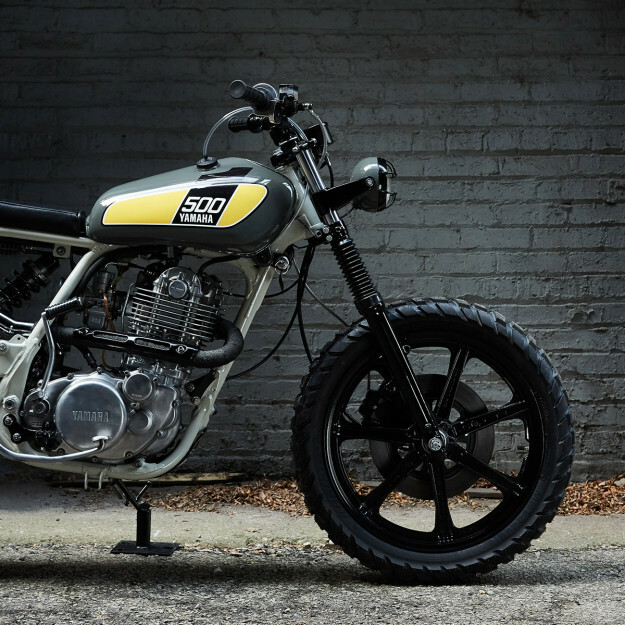 Shaun’s now got himself a slim, maneuverable SR500 that works on both tight city streets and cruisy beach boulevards. Shaun is originally from Canada, but he’s just moved to the sunnier climes of Miami, Florida. “Being able to ride all year round is a dream come true, after coming from a city with a three- or four-month safe riding reason,” he says. The move prompted Shaun to get himself a new set of wheels. 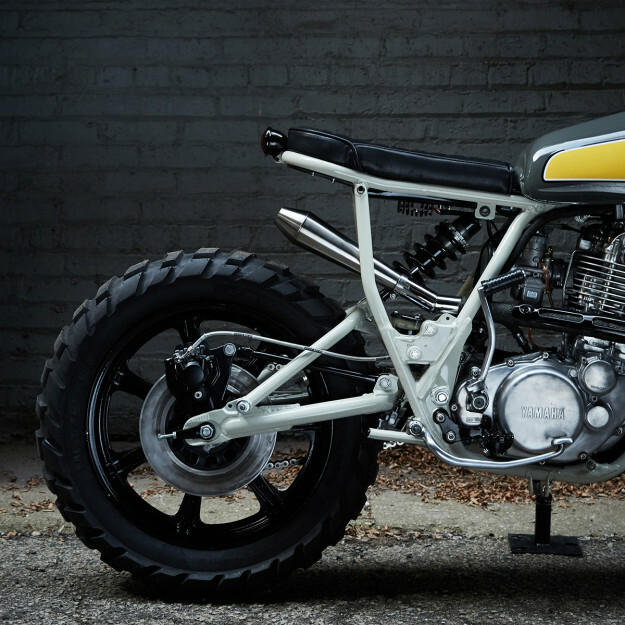 And there could be no other choice but the Yamaha SR500. Shaun found a 1978 model, from the first year of production. 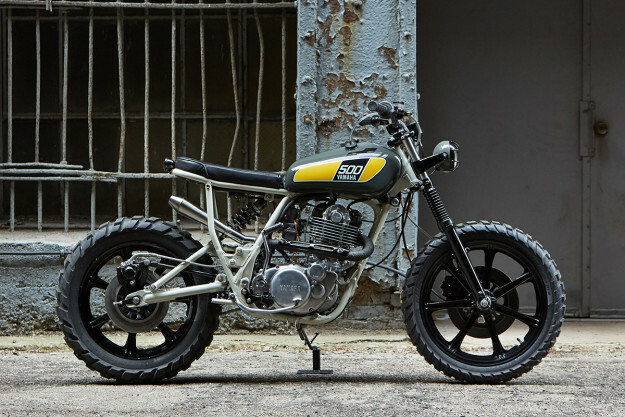 SR500s are in demand so prices are fairly high, but mint condition bikes go for around $3,000. 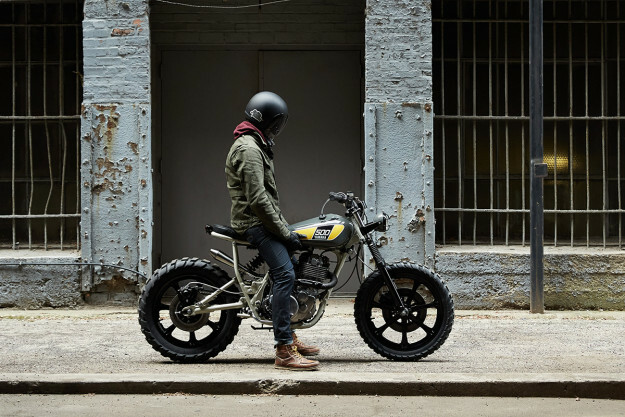 Shaun and Mike decided to create a bike that’s fun to ride on short trips: “My office is close to home, and the beach is a ten-minute ride across the bay,” says Shaun. So what are the mods? 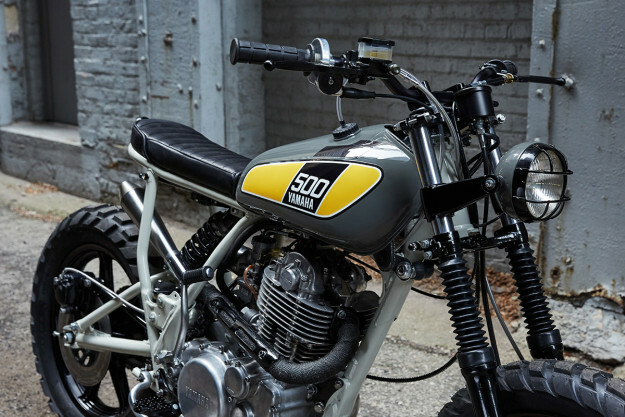 The biggest visual changes are the Yamaha TT500 fuel tank and the 1970s headlight, lifted from a Honda TL250. 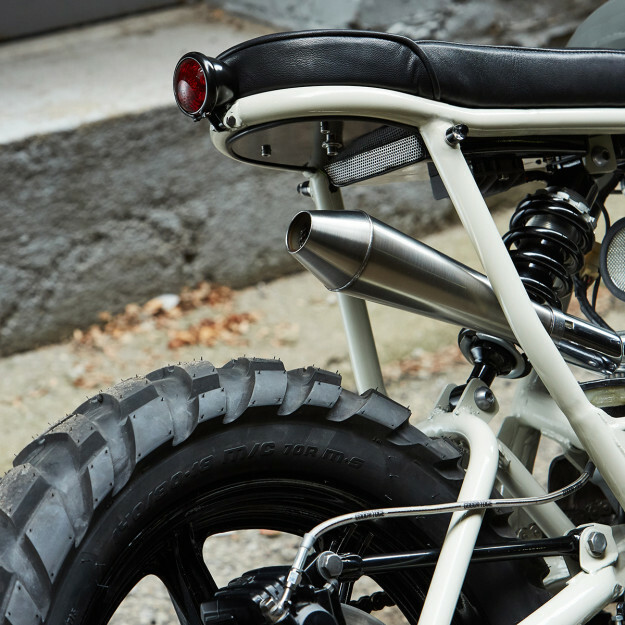 The mono-shock rear suspension comes from a Triumph Street Triple, and right above it is a custom seat and the supporting framework. Hidden away from sight is a shallow electronics tray—drilled for ventilation—holding a Motogadget m-Unit. 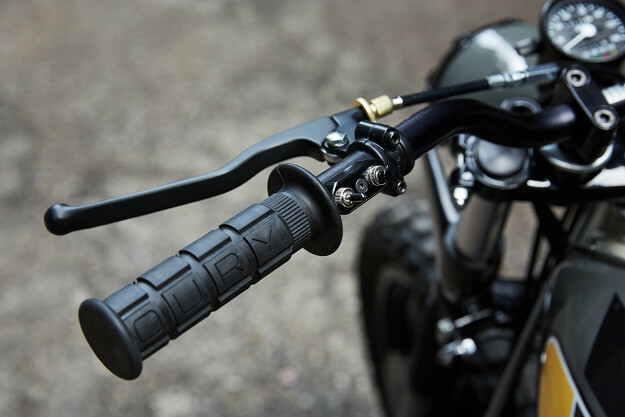 The cabling is discreetly wired inside the bars using Motogadget’s m-Button system, and there’s a Bates taillight at the back. The single-cylinder, air-cooled engine has been mostly left alone. 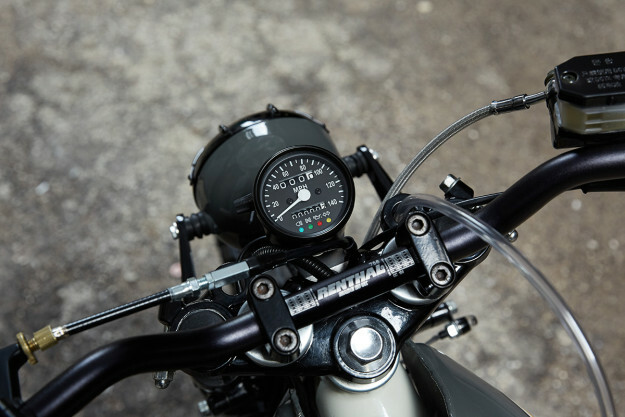 But for extra oomph and smoother throttle response, Mike’s installed a Mikuni VM38MM carb—pre-jetted and supplied as a bolt-on fitment by Dime City Cycles. He’s also fitted a K&N crankcase breather filter, and a discreet head-mounted Motolanna compression release. The exhaust pipe hugs the engine tight: it’s a header from a TT500, mated to a simple 12-inch ‘Shorty Cone’ muffler exiting under the seat. 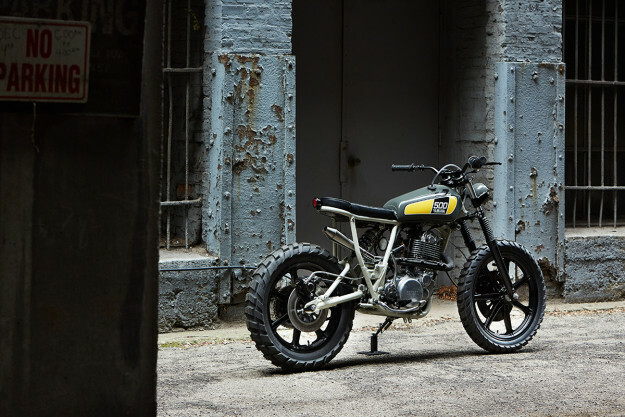 The tires are Metzeler Karoo 3s—a chunky dual-sport pattern that performs amazingly well on the street, without any of the squirming you’d associate with knobbies. Shaun’s treated himself to a set of top-tier cockpit upgrades too. He’s chosen Renthal’s Ultra Low bars fitted with Oury grips, m-Blaze turn signals and simple retro-style switchgear from the Japanese maker Posh. The paint is fresh and light—a minimalist interpretation of the classic speed block design. It’s by Nicolas Lama, a Bolivian-born artist and Powder Monkees collaborator. 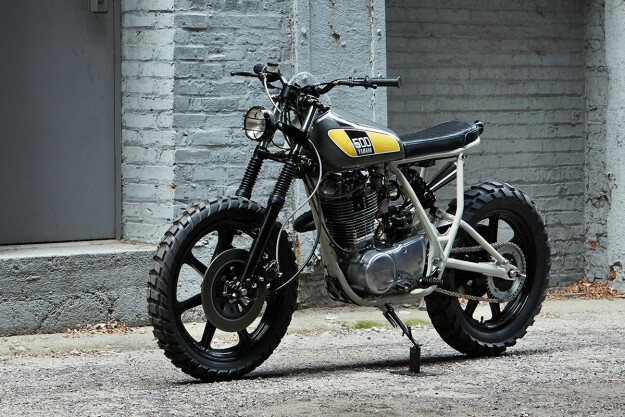 Shaun’s SR500 is now the perfect downtown daily rider and weekend beach cruiser. He’s called it “Sunshine State of Mind”—a great name for a bike guaranteed to put a smile on your face. 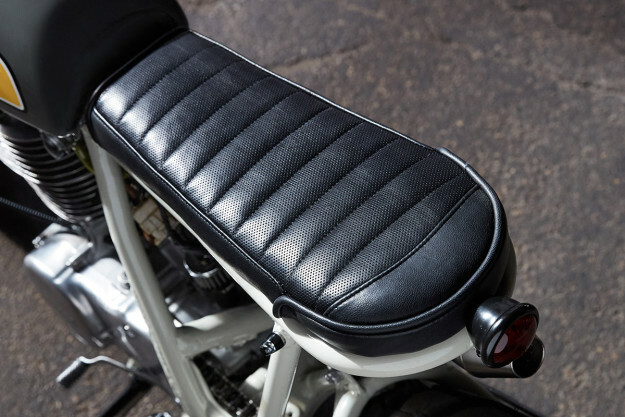 Are We Ready For A Suzuki Bandit Cafe Racer?